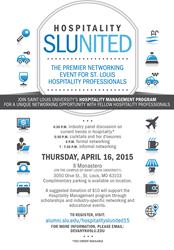 The School for Professional Studies at Saint Louis University will host the 3rd annual Hospitality SLUnited– a networking event for hospitality professionals on Thursday, April 16. With more than 10 industry partners, Hospitality SLUnited provides students and professionals a forum for open discussion, with both formal and informal networking opportunities. Last year’s guests represent companies including, Sheraton St. Louis City Center Hotel & Suites, Meadowbrook Country Club, Lumiere Place, Maritz Travel, Expedia and Levy Restaurants. Attendees reported making an average of five to six new industry contacts. Free to attend. Donations will support scholarships in the hospitality management program. For more information or to register for the event, visit busyadults.slu.edu. Association partners in attendance will include the Event Planners Association, Hospitality Sale and Marketing Association International, St. Louis Convention & Visitor’s Commission, Meeting Professionals International, Missouri Restaurant Association, International Special Events Society and the St. Louis Area Hotel Association. SLU offers a 21-credit hour hospitality management program as a stand-alone certificate or minor. Available completely online, this innovative program is formatted for working adults. Courses are designed to prepare graduates for a leadership role in a hospitality organization by developing problem-solving, administrative and interpersonal competencies through professional insight and experiential learning. Students are exposed to relevant, industry-specific topics such as international travel & tourism, event management and hospitality technology. Classes in the School for Professional Studies are typically offered in accelerated eight-week sessions and are designed for busy adults with affordable tuition rates as well as convenient, online classes. SLU for Busy Adults gives working professionals the opportunity to earn their degree with flexible online and evening courses. In Saint Louis University’s tradition of excellence, the School for Professional Studies caters to nontraditional students so they can pursue Bachelor’s and Master’s programs from globally-recognized SLU.